ADVERTORIAL O ADVERTORIAL T he award-winning Celluma is FDA-cleared to treat acne, wrinkles and pain. Clinically proven and results driven, one Celluma device does it all! Easily integrated into most spa menus, it can enhance outcomes while generating additional revenue and referrals. 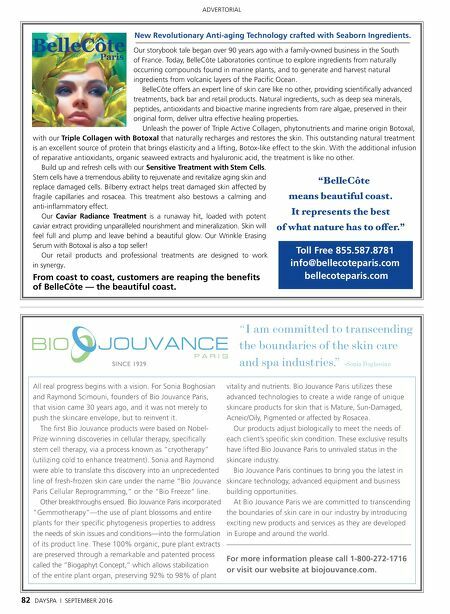 Relaxing and rejuvenating, Celluma can be offered as a powerful stand-alone modality or as an add-on to most services, including facials, massage and waxing. Celluma is also ideal for use following laser, microdermabrasion, microneedling, peels, injectables and much more. Celluma is CE Certified in the European Union for dermal wound healing. Three models are available. Celluma PRO: Unique in design, the Celluma PRO is quite unlike any LED device available today. The hands-free panel is flexible and shape-taking, allowing it to conform closely to the area of treatment, a key to effectiveness. Sized perfectly for facial treatments, the Celluma PRO is easy to use with three pre-programmed settings to effectively treat acne, wrinkles and pain conditions. Celluma LITE: The Celluma LITE delivers the same powerful results as the Celluma PRO in a more compact size ideally suited for resale and travel. While designed specifically for positioning over smaller areas, such as elbows, wrists and knees, the Celluma LITE can be used anywhere on the body, including over the face to treat wrinkles, acne and pain conditions. In order to use the Celluma LITE over the face, a pair of Celluma LITE Facial Rests are required and are not included with the Celluma LITE . Celluma ELITE: The Celluma ELITE is stand-mounted on a sturdy rolling base for mobility and offers the same features and specifications as the original Celluma PRO, including most of the flexibility aspects. An articulated and rotating arm provides a wide range of placement options for clients. The Celluma ELITE is also ideal for use in a "self-service" type of environment. 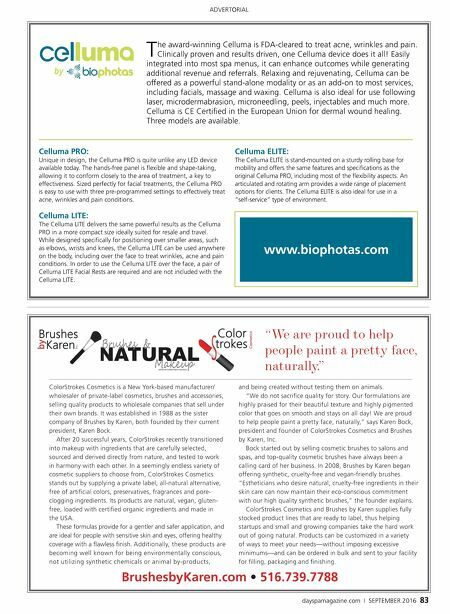 www.biophotas.com dayspamagazine.com | SEPTEMBER 2016 83 BrushesbyKaren.com s 516.739.7788 ColorStrokes Cosmetics is a New York-based manufacturer/ wholesaler of private-label cosmetics, brushes and accessories, selling quality products to wholesale companies that sell under their own brands. It was established in 1988 as the sister company of Brushes by Karen, both founded by their current president, Karen Bock. After 20 successful years, ColorStrokes recently transitioned into makeup with ingredients that are carefully selected, sourced and derived directly from nature, and tested to work in harmony with each other. In a seemingly endless variety of cosmetic suppliers to choose from, ColorStrokes Cosmetics stands out by supplying a private label, all-natural alternative, free of artificial colors, preservatives, fragrances and pore- clogging ingredients. Its products are natural, vegan, gluten- free, loaded with certified organic ingredients and made in the USA. These formulas provide for a gentler and safer application, and are ideal for people with sensitive skin and eyes, offering healthy coverage with a flawless finish. Additionally, these products are becoming well known for being environmentally conscious, not utilizing synthetic chemicals or animal by-products, and being created without testing them on animals. "We do not sacrifice quality for story. Our formulations are highly praised for their beautiful texture and highly pigmented color that goes on smooth and stays on all day! We are proud to help people paint a pretty face, naturally," says Karen Bock, president and founder of ColorStrokes Cosmetics and Brushes by Karen, Inc. Bock started out by selling cosmetic brushes to salons and spas, and top-quality cosmetic brushes have always been a calling card of her business. In 2008, Brushes by Karen began offering synthetic, cruelty-free and vegan-friendly brushes. "Estheticians who desire natural, cruelty-free ingredients in their skin care can now maintain their eco-conscious commitment with our high quality synthetic brushes," the founder explains. ColorStrokes Cosmetics and Brushes by Karen supplies fully stocked product lines that are ready to label, thus helping startups and small and growing companies take the hard work out of going natural. Products can be customized in a variety of ways to meet your needs—without imposing excessive minimums—and can be ordered in bulk and sent to your facility for filling, packaging and finishing. "We are proud to help people paint a pretty face, naturally."